The LA County Suicide Prevention Network and its members work each year to coordinate the Los Angeles County Suicide Prevention Summit, which occurs annually in September. Each event highlights different perspective, best practices and populations to help attendees better understand the role they can play in suicide prevention. The 2018 Suicide Prevention Summit took place at the California Endowment on September 6, 2018. To address suicide prevention using a public health approach, everyone in our communities needs to understand what role they can play. Before we can find our role, we first need to find our passion. 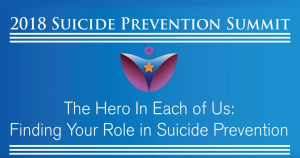 The goal of the 2018 Suicide Prevention Summit was to help you as a person, as a professional, and as a friend or family member, gain a better understanding of the landscape of suicide prevention so you can see where you fit in, and then give you the skills to assist people in finding their reasons for living. The keynote presentation provided an overview of the latest best practice and national guidance for effective suicide prevention. Participants learned about the latest tools for community-based suicide prevention, strategies and principles that should be part of prevention efforts, as well as resources and guidance that exist for different settings and professionals. The essential ingredients of starting with available data, using a combination of strategies for prevention, and establishing broad partnerships and community engagement will be highlighted. An example from the National Action Alliance for Suicide Prevention was featured to model partnerships with new and nontraditional sectors for suicide prevention. These broad concepts were incorporated into five core elements to help participants make their local prevention efforts as effective as possible. Women Vets on Point – A website specifically for homeless female veterans to be connected directly with mental health providers who specialize in working with women veterans. A panel of individuals representing local organizations will shared inspiration about how they have integrated suicide prevention into their work. The panel was moderated by Stan Collins. This workshop explored principles related to responding to a suicide death in the community and school setting. Knowing that a suicide death can have a varied and often negative impact on the survivors of suicide loss, combined with most recent estimates suggesting that upwards of 100 individuals are impacted by each suicide death, it is vital that communities and schools are positioned to respond effectively and appropriately when suicide deaths occur. Presenters: Sandra Black, MSW and Laurel Bear, Ed.D.